Welp…in news that is sure to be a bummer, it’s been confirmed by THR that PBS’ civil war mini series Mercy Street will not return for a third season. PBS and the producers cited “the complicated nature of aligning production timelines and funding commitments” as the reason behind the show’s sudden end. 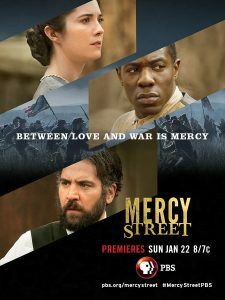 Premiering in January 2016 alongside the final run of Downton Abbey, Mercy Street marked PBS’ first original series in more than a decade. The drama opened to 3.3 million viewers and ranked as PBS’ second highest-rated drama of 2016, behind only Downton Abbey. Season two, which kicked off in late January and wrapped March 5, drew 6.5 million viewers for the first three episodes with seven days of DVR factored in. In other news, after much casting rumors that bounced around for months, Mary will not be playing Domino in Deadpool 2. Instead, the role will be played by Atlanta‘s Zazie Beetz.